What makes pressure cooking so special? Getting a meal on the table is not as simple as it used to be. Family taste preferences need to be carefully balanced with concerns about health, nutrition, and food safety. Time is also a major factor with busy dual income households and extra activities infringing on our schedule. Although the pressure cooker is not a new concept, it’s clear why its popularity is resurfacing. It’s the answer to our time crisis, and it returns us to the quality of food we once knew -- and desire to properly feed our family today. Many post-baby boomers are bewildered by the concept of pressure cooking. 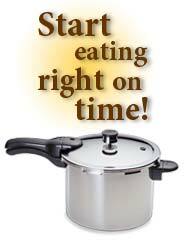 A pressure cooker is simply a pot with an airtight lid that builds steam internally to temperatures higher than the boiling point, therefore allowing foods to cook in one-third to one-tenth the time of conventional cooking methods. Today’s pressure cookers are completely safe and much easier to use than ever before. Flavorful recipes featuring meat, poultry, fish, vegetables, rice, and legumes cook to perfection in minutes. 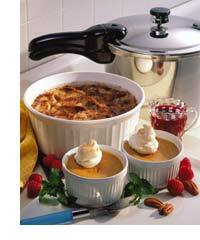 The pressure cooker even makes delightful desserts in far less time than normal methods. Saves Time: Foods cook three to ten times faster than ordinary cooking methods. Whole meals can be cooked in one pot -- without having flavors intermingle -- saving cooking and cleaning time. Some foods can even be precooked in the pressure cooker and then finished using a conventional method, if desired…still saving time and getting a wonderful meal on the table fast. Saves Money: Super fast cooking translates to lower energy bills. For example, using one burner for 30 minutes versus heating up the oven for 3 hours saves money! The pressure cooker turns budget cuts of meat into tender, tasty meals saving you money at the supermarket. Retains Nutrients and Flavors: Because foods cook quickly with a small amount of liquid in an almost airless environment, vitamins and minerals that are normally boiled away in the cooking process condense in the pot and absorb back into the food retaining the precious nutrients naturally found in our food. Offers Safety Features: Today’s modern pressure cookers offer multiple safety devices. A locking cover handle prevents the cover from being opened until the pressure inside the cooker has safely dropped. Most newer pressure cookers feature a visual indicator showing if there is pressure inside the cooker. In addition, secondary pressure relief mechanisms have been designed to allow steam to escape in the rare occurrence the vent pipe should become blocked. The Presto® Pressure Cooker is the perfect solution to fast, healthy, and satisfying meals! Cooks 3 to 10 times faster than ordinary cooking methods. Saves time, energy, and money. Special tri-clad base for even heating. Ideal for use on regular and smooth-top ranges. Includes cooking rack and 64-page instruction and recipe book.